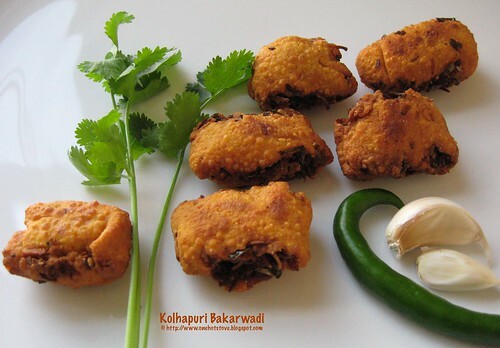 Maharashtrian cuisine, like the other Indian cuisines, has one category of recipes that is specially loved: all the crispy crunchy melt-in-the-mouth tea-time snacks! Some of these goodies are made specially for festivals, others are made in batches and stored in air-tight containers, waiting for friends and relatives to drop in unexpectedly. One of these special savory foods is called the bakarwadi. What is bakarwadi? You can think of it as a Swiss roll, only fiery hot! 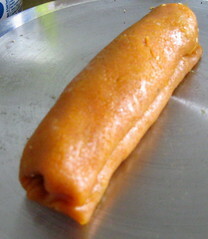 A savory filling is rolled into a chickpea dough, and slices of this roll are deep-fried. 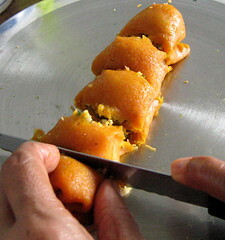 The resulting savory bites are a favorite tea-time treat, and also specially made during the festival of Diwali. When people in Maharashtra think of bakarwadi, they generally think of a particular type made famous by the Chitale Bandhu store in city of Pune. Their version is iconic, with its sweet-savory filling. While I am a huge fan of this style of bakarwadi, there is another kind that I am also very fond of. This is the lesser-known but no less delicious Kolhapur style bakarwadi and as with all good Kolhapuri food, it is redolent with chillies and garlic! Kolhapuris have a undying love affair with devastatingly pungent flavors in food, and this love is neatly packaged into that awesome snack called the Kolhapuri bakarwadi. 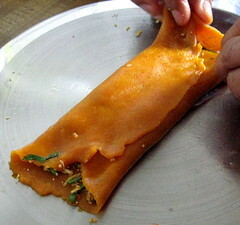 The truth is, if you live in Kolhapur, you don't need to waste your time making this bakarwadi at home. You just go over to a rather industrial section of town, to a nondescript store-front called Gruhini (means homemakers in Marathi) and buy piping hot bakarwadi that is better than anything one could ever make. This store is a kind of women's cooperative, where homemakers seeking an income work together and put their amazing culinary expertise to profitable use. At the back of the store, you can see a band of experts churning out the most amazing sweets (gulkand burfi or fudge, coconut burfi), dry chutneys and masala mixes, savory goodies (chakli, bakarwadi)...all with the true authentic taste of home, only made in slightly larger batches and sold commercially. At the front of the store, there is a chalkboard listing the goodies being made, all sold at extremely reasonable prices. This place is a blessing for everyone who loves the taste of old-fashioned food made with all-natural ingredients but who is short on time or does not have the know-how, or simply does not want to take the trouble of making a large-scale complicated recipe for a tiny family. People become adept at knowing what goodies are being made at what times, and you have to be smart and show up at the right time if you want to get your hands on it! When you ask for a kilo or so of bakarwadi, a couple of the women at the front counter will fill your order, and hand you a packet of bakarwadi so piping hot that there is condensation on the bag. This week, my mom was eager to try some adventures in the kitchen with me. She had bought some bakarwadi for V and me from this store in Kolhapur, and when she saw how we wolfed it down, she offered to try making it at home. The last time she has made this was over 25 years ago, she says. Since that time, the Gruhini store has been feeding our habit! She looked around for a recipe and found one in a slim 1987 Marathi cookbook called Swad-Aswaad by Usha Toraskar and Vasantaprabha Chitnis. This is quite a challenging recipe, not really for the beginner cook. There are many steps at which you could face pitfalls- the dough might crack while rolling, or the rolls could fall apart while frying etc. So we were happily surprised at how tasty and successful our little experiment turned out. Here it is, the recipe in my mom's words. She starts by saying, "Caution: Be prepared for hot fumes coming from your ears and mouth. Keep your hankies ready!" 1. Make the dough: Heat the oil, put in the besan, turmeric powder, red chilli powder, salt and make a stiff dough adding only a few spoonfuls of water as necessary. Divide the dough into 4 portions and set aside. 2. 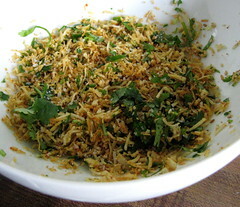 Make the stuffing: Lightly roast the dry coconut, sesame, poppy seeds, garlic, ginger, green chillies, cilantro. Add the garam masala, and salt to taste. Mix well and set aside. 3. 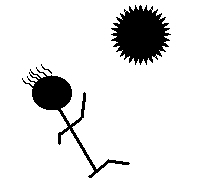 Roll out one ball into a circle. The edges should be rolled as thin as possible, but the center should be relatively thicker. 4. Divide the stuffing into 4 portions. Sprinkle one portion of stuffing onto the dough circle. 5. Fold the four edges like an envelope and make a roll. 6. Cut each roll into 5 pieces or so. 7. 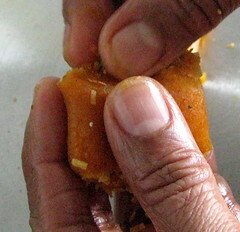 Press the edges gently to hold in most of the stuffing while frying. 8. Deep-fry on slow fire until dark brown. If you fry on high heat, the inside of the roll will not get a chance to cook. 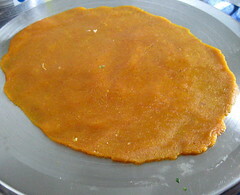 Tip: If the dough is not stiff, the bakarwadi will be soft and not stay crisp in the next few days. We enjoyed this home-made bakar-wadi very much. This little trial made for an enjoyable time in the kitchen for my mother and me. But I don't see myself making this often...the deep-frying and the degree of difficulty being the two main reasons. I will save my appetite for the next trip to Gruhini instead! See you at the U of Indian Vegetables on Sunday! Entries are being accepted all the way until Saturday night. It is a rather challenging letter but I am sure I will be impressed by the bloggers' entries yet again! Nice pics! !Tempting to eat spicy snacks.Coming with my dishes for RCI soon. i have tasted this back in belgaum and it has always been my fav tea time snack. i can still remember the taste of coriander and fennel seeds in them but i guess kolhapur style is different from usual bakarwadi. Nice step by step photos...will be easy to follow without doubt...will try it out soon...thanks.. I just loved your bakarwadi..we make a similar one at home minus the Garlic and ginger.I have to try this one out..it's a refreshing change from the sweetish bakarwadi from Chitale(that's a brand you get in Pune)their's is good but home made bakarwadi always wins.good recipe. Like daughter, like mother, I see! I have told D several times that I would love to have a Chai shop of my own and serve samosa and bondas with hot tea there, but he is sure me & my friends would eat them instead of errr serving customers. I luv luv luv Bakarwadis! Its incredible that you made them at home!! Incidentally I just received a fresh pack of Chitale bakarwadis from India yesterday!!! The bhakarwadi looks so delicious. Thanks for the step by step instructions and pictures. It has encouraged me to try it out. We love bhakarwadi and get some when we make a trip to Mumbai. Enjoy your mom's cooking! GVB, I'm excited to see your RCI entry! 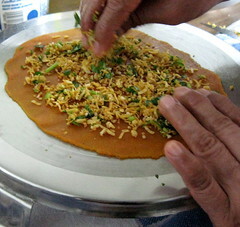 Srivalli, since you are an experienced cook, I am sure you will succeed in making this! Raaga, it is definitely easier to buy :) instant gratification! Madhuli, would love to see your home-made version sometime...sounds delicious! Arts, I have to try Asha's recipe...it looks fabulous. I know, with two cooks in the kitchen, step-by-step snaps are now possible :) Normally, I can never manage it on my own! Dhana, you lucky thing...how about sharing some with us :D ? Oh I love Kolhapuri bakarwadis. Such a welcome change from the usual ones from ChitaleBandhu. 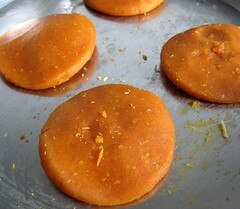 Our neighbour in Pune used to make these for Diwali and we all looked forward to them. Yours look so appetising. The reddish-brown colour, perfect. What a pleasure it must be to have your mom right there, experiementing and making things with you in your kitchen. Sounds all warm and cuddley. Would love to have some of your bakarwadi. Love yr step-by-step photos.. It helps a novice like me..
Ur Mum is an awesome cook too !!! Kolhapuri bakarwadi, wow!! time consuming and difficult, but in the end worth it all! It looks very appetizing. Anything made my moms are always better than the store i feel. A small question: whenever i have eaten bhakarwadi, they contain a tangy taste too, tamarind or amchoor i was thinking. I dint see that in your recipe. Is that a different way of making it? Wow! I am speechless. They look awesome, it looks like cut mirchi after it's fried. Should give it a try when I got plenty of time. Thanks. Me going on a holiday to meet my family members, will impress them with your recipes :-). Hi Nupur - looks like you're having fun with your mom. I'll bet V. and your dad are enjoying the results of your kitchen experiments! Bhakarwadi is my dad's favourite snack so much so that we tease him that 3 pm is his 'bhakarwadi' time. Also our relatives in Madras have only one demand when anyone goes from Bombay - one big packet bhakarwadi please!! A farsan guy near my parents place does a darn good job, as much as I'm tempted to try, 20 pieces and so much mehnat :( my laziness gets in the way! The Kolhapur style Bakarwadi is called as "Pudachi Wadi"..Its an integral part of "Faral" my mom( My parents are from Kolhapur) makes for Diwali. I don't have a food blog but would like to participate in RCI- Maharashtrian Cuisine.. Is that okay? Suganya, oh, come on! I am sure you have some fabulous ideas up your sleeve! Manasi, yes, it was worth it, we truly enjoyed every bite of these! Shital, yes, this is different from the more common bakarwadis which have the tangy taste. Vani, glad you like it! Nandita, LOL your dad and I have a common philosophy about tea-time, I see! Vidula, sure you can participate. Do send your write-up, recipe and picture to me via e-mail and I'll be happy to post it! Thanks for the enthusiasm. Hello, I used to work with a gentleman would get Bakarwadi sent to him from India. He let me try it and it was love at first bite. I began to dream of it at night. I always want more. I wish somebody in the Cleveland, Ohio area could duplicate that most delicious flavour. You might get them in Indian store nearby. Try to see if you could get CHITALE Bakarwadi, not same as homemade but still delicious!! Should try this some time.I made a similar Bakarwadiand turned out well.The one u made is Pudachiwadi right?I din no it was kolhapur special.Got to try them. gruhini website is using your bakarwadi picture.